And yeah. Father’s Day is coming up and it’s time to get a gift. I created this list gearing more toward your husband. Although, my dad would like or all ready own some of the gifts on this list. Just a few ideas to help you this Father’s Day or ignite other ideas. Wild lily floral board shorts by J.Crew. If your man is still wearing swimsuits with an elastic band, help him grow up a bit with actual board shorts. I like these from J.Crew. Geek Dad . A whole book full of ideas, activities and other fun things your husband can do with the kids. Bella Bryson longboard skateboard. It’s a cruiser. Like surfing a longboard. And these are hand crafted for a great price. Tumbler leather belt from Banana Republic. A casual looking belt that goes great with anything. Plus when was the last time he got a new belt? Small carry on bag from Filson. The best looking carry on bag any guy will carry when traveling but manly enough where he would carry it. Grey heezen burlap men’s stitchouts from TOMS. Every pair of Toms shoes you buy, the company donates a pair to a child in need. It’s a gift that you can feel good giving. The Baby Owner’s Manual . Who said babies don’t come with an instruction manual? And this new dad will need one. Diaper Dude messenger II. It carries everything the baby needs and the dad’s needs in a stylish way. Deuter kid comfort child carrier. Let him enjoy the outdoors with the baby for some daddy bonding time. 8-bit tie. I didn’t get this either. I had to look into it and it’s an old video gaming thing. And it’s even a clip-on tie. He could wear it with a T-shirt if he wants. Digital spy camera. 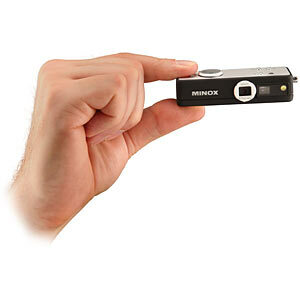 He’s going to feel like the next James Bond with this digital camera that’s less than 4 inches long. Just say it’s a way for him to get more pictures of the kids, right? Super Mario Galaxy 2 . It just came out. And if he has beaten the first, could you ask him to help out my husband? Nathan can’t seem to get that last level. KSO FiveFingers shoes by Vibram. The latest in shoes technology. Leaving the feet in its most natural state, it is supposed to help with everything – running, posture, balance and health. Wear it running, hiking, playing or to work. iPod + Nike. It tracks all the running and on the iPod. Then he can upload it all online, challenge friends, track his progress. It’s his own digital personal trainer. Sardine survival kit. Waterproof sardine can that is packed full of 19 things for emergency survival, including a Tootsie Roll for food. Take it on the next campout. Mesh roasting pan from Williams-Sonoma. Roasting meat or vegetables on the grill. The mesh keeps even the smallest ingredients inside. Best of all, it’s dishwasher safe for easy cleaning. 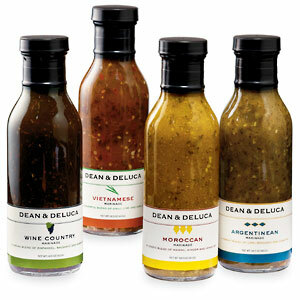 Gourmet marinades from Dean & Deluca. It’s currently on sale when your purchase a set of four. Indulge in some of the finest marinades. Inflatable movie screen. Bring the TV outdoors to him while he’s grilling. Better yet, make it an outdoor party for all. Pocket Ref . The go-to book for everything a guy needs to know about how to attach, fix, put together just about anything. And it’s pocket size. Magnetic wrist band from Red Envelope. Just like we have our pin-cushion wrist band, now he can have his. Black & Decker workman tool bar. I can see myself using something like this for my craft tools. Easy to reach and see. » Tell me… What are you getting your dad or husband for Father’s Day this year? I just bought some Vibram Bikila shoes for both me and my husband. Can’t wait to get them! I love these gift suggestion posts. You find some good stuff! Thanks. I have no idea what I’m getting my husband. These are really fun ideas, thank you! You have some great options here! I’ve been having some knee pain recently and wonder if those new-fangled Vibram shoes you have on here would help (some folks have told me that they’re good for feet, as you reference in the blip). Great seeing you again this weekend. Hope your family was able to function without you Saturday and that y’all have a great Sunday.